BAoBaB: Blue Acid/Base Battery is a collaborative project gathering 6 european partners from 3 different countries that started in May 2017. 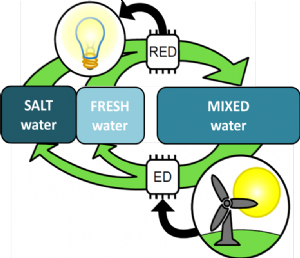 The consortium of this project proposes a new solution for energy storage where electricity is stored through the combination of Electrodialysis (ED) and Reverse ElectroDialisys (RED). To improve the performance of the combination of ElectroDialysis (ED) and Reverse ElectroDialysis (RED), the consortium use in addition solutions of acid and base that increases the energy density of the storage system up to 7 times. The goal of BAoBaB is to develop this next generation storage technology from “proof of concept” (TRL3) to “validated in relevant environment” (TRL5). a. to establish and extend the potential of BAoBaB to become a reliable and environmentally friendly way of storing (renewable) electricity at kWh-MWh scale for application at user premises or at substation level. 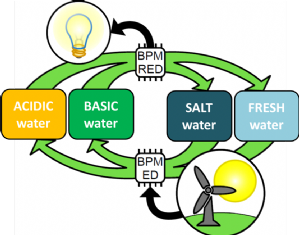 b. to understand and enhance mass transfer in round-trip conversion techniques and hence to improve the energy conversion efficiencies of the BAoBaB system. We aim at competing performances to pumped hydropower storage (PHS) by obtaining energy conversion efficiencies of over 80% and >10 times higher energy density. 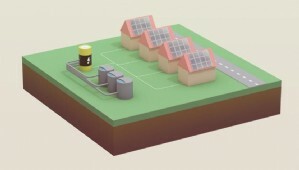 c. to validate under accepted utility use conditions an automatically operated BAoBaB system at a scale of 1 kW power and 7 kWh energy storage. d. To pave the road for cost competitive energy storage with attention to life-cycle cost and performance. The aimed potential levelized cost is <0.05 €/kWh/cycle, which would be an economically scalable EES without subsidies.